One day after the release of post-September announcement developer betas, Apple has also made available public versions of iOS 10.1 (featuring Portrait mode for the iPhone 7 Plus) and macOS 10.12.1 to eligible participants. The biggest addition to the beta version of iOS 10.1 over the initial iOS 10.0.1 release from earlier in September is Portrait mode for the iPhone 7 Plus. 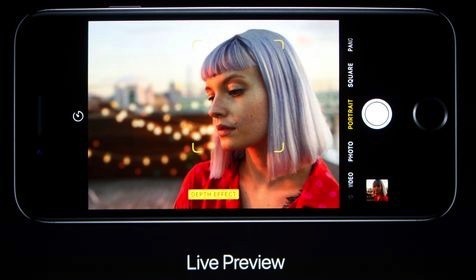 Users must lock onto their subject in Portrait mode to separate it from the background, with the software implementing a bokeh depth-of-field effect utilizing both the regular camera and the telephoto lens. Photos captured in the portrait mode with a bokeh application are labeled with "Depth Effect." The iPhone 7 Plus can produce a selectively out-of-focus portrait, utilizing a depth map generated by the dual-camera setup. While the feature was demonstrated at the iPhone 7 Plus unveiling earlier this month, it did not ship with the device and is scheduled for a future iOS 10 release. The public beta of iOS 10.1 is a 1.8 GB download for the iPhone 7 Plus. Both the iOS and macOS public beta builds match Wednesday's public betas. Apple's public beta program is free for Apple ID holders, requiring only a pre-registration process. iOS 10.0.1, watchOS 3 and tvOS 10 were released publicly last week. macOS 10.12 Sierra launched to the public on Tuesday.